It is not uncommon for universities to renovate their football stadiums, many of which were built dozens of years ago and require vast improvements to remain modern. What is unique; however, is the approach Purdue University is taking with its planned renovations of Ross-Ade Stadium, the home of the Boilermakers since 1924. As a key component to the “Your Ross-Ade Stadium” campaign, the university has hired Elevate Sports Ventures “to oversee a fan-centric, data-driven study to shape the strategy for renovations to Ross-Ade,” according to Purdue’s website from a January 14 announcement. Elevate Sports Ventures is a sports and entertainment consulting firm launched in partnership between the San Francisco 49ers and Harris Blitzer Sports & Entertainment in January 2018. Since its formation, Elevate has brought on Oak View Group, Ticketmaster and LiveNation as partners. The survey, which will be distributed to season ticket holders, single and multi-game ticket purchasers, current students, alumni and fans beginning January 18 in certain areas, will focus on concessions, entertainment, parking, restrooms, game-day experiences and more. Aside from the expected tens of thousands of survey participants, hundreds of group interviews will take place. “This will be a study unlike any other that has been generated in the college space. The size and scope of the constituents, fans, season ticket holders, alumni, is massive – as is the range surrounding Purdue University we are surveying, from West Lafayette-Lafayette, Indianapolis, throughout Indiana, Chicago and more,” said Tom Moreland, Vice President of Strategic Initiatives at Purdue. 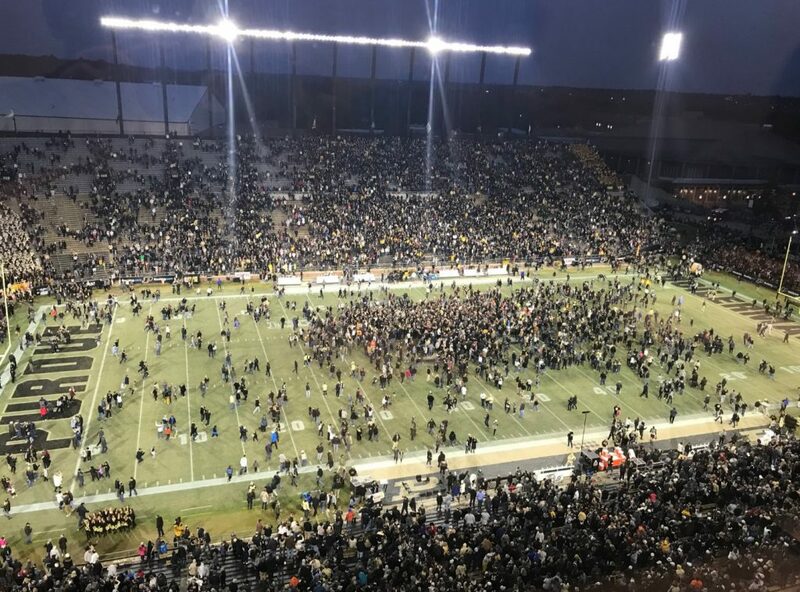 While inviting fans to provide feedback on the future look and feel of their team’s stadium is new to the university, renovations to Ross-Ade certainly are not. From 2001 through 2003, the Boilermakers’ home went through a $70 million facelift, which included the addition of outdoor club seats, new bathrooms and concession stands, and other improvements. The stadium’s current seating capacity is more than 57,000 and able to cater to the growing attendance. From 2016 through 2018, the football program saw an increase of nearly 50%, which led the nation, and boasted an average attendance of 51,120 this past season. Part of the rise can certainly be attributed to success on the field. Purdue University struggled from 2013 through 2016, winning a total of nine games and failing to make a bowl game. In the past two years; however, the team has made two consecutive bowl games, winning seven and six games in each respective season. Along with better outcomes in the box scores, the Elevate Sports Ventures study is expected to produce actionable results for the university, turning Ross-Ade into the ultimate home-field advantage for fans and players.